More in our series of monthly gardening tips from Heritage Gardens gardening correspondent Geoff Hodge. Geoff is a garden writer, author, editor and radio and TV broadcaster. He writes for numerous gardening magazines and has written several gardening books, including Pruning, Collins Practical Gardener - Bulbs, RHS Allotment Handbook and RHS Allotment Journal. His next book, RHS Propagation Techniques, is due for publication in spring 2011. Lots of good advice for the gardener as Spring progresses. 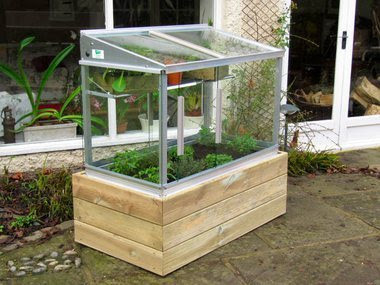 Patio Cold Frame (pictured above). We'll be adding new products every month so keep coming back !